“Why is it so addictive!” asks one youtube commenter. “What a nice guy!” writes another. Other comments are dedicated to endlessly repeated in-jokes. Of course this is about Bares für Rares, Germany’s most popular afternoon TV show. And as I watch the parade respectable middle class Germans unload unwanted family mementos, flea market finds or just whatever they could get their hands on to get on TV I have to admit, it’s strangely and weirdly calming and… addictive. 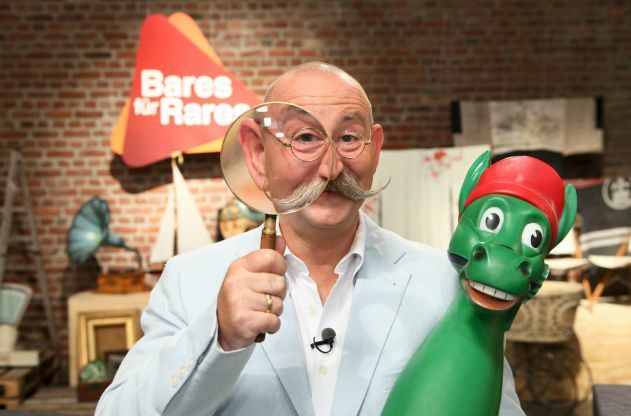 Basically Bares (the German title roughly translates “Cash for Rare stuff”) is officially listed as a docu-soap, a sub-genre of reality TV. The idea is that everyday, real people bring antique or collectible items to the show, the items are evaluated by an expert and then those who make the grade get a “seller’s card” and then face a panel of antique-collectible dealers who make bids for the item. I looked up the very first episode which was shot in a kind of cinema verité style with jerky editing, some Dutch angles and the background noise ramped up. It soon wore away those rough edges and evolved in a sedate and ritualized experience. Die Expertin (in red) figures out how much whatever this thing is is worth. The approach: The seller is shown approaching the studio carrying what they want to sell while the announcer makes oblique references to what they have to sell. Alternately large and bulky items are shown being unloaded from cars. Then they face the camera and explain why they want to sell the item. They are then shown entering a large hall while the announcer reminds the audience they have to earn the elusive Händlerkarte before they can sell it. Will these people buy used crap from you? The evaluation: In a large room with people holding weird objects and waiting in line, the seller approaches one of three help desks, each manned by a different expert. There is one for jewellry, one for works of art and a third miscellaneous desk though the division is not always clear cut – a watch might be evaluated by any of the three… Then the ingratiating host, Horst Lichter, who looks a bit like an egg with a grey handlebar moustache introduces himself and the expert in question who begins evaluating the offering. The expert dates and describes the object and points out what makes it valuable (or not). The host asks how much the seller wants (sometimes expressed in Schmerzgrenze (how little they can stand to sell it for). and then the expert gives their evaluation. Over nine out of ten times the seller then receives the most useless prop in the world – the Händlerkarte. The camera zooms in as Horst hands over the card which is never seen or referenced again… I don’t know what is the deal with that, it’s like a prop that never quite worked out but that they can’t get rid of. Very occasionally the seller is unsatisfied with the “Expertise” and decides they don’t want to sell. The sale: The seller expresses their hopes or strategies for selling the item and is then shown walking into a room where they face a panel made up of five buyers (antique dealers) who look the item over and then start making bids and the seller talks up the item. When the bidding runs out of steam the seller is asked if they’ll sell. Usually they do (maybe wheedling a little bit more on the price). The buyer counts out the money on the spot and they shakes hands. The seller then addresses the camera and expresses how happy they are with the money they just made. Again, very occasionally the bids are too far below the seller’s Schmerzgrenze and they leave without making a sale. Occasionally, when bidding is cold Horst shows up and talks up the item (which is a clear cue to the buyers to start bidding more which they almost always do). That’s it. Simple, reptitive and strangely addictive and calming at the same time. 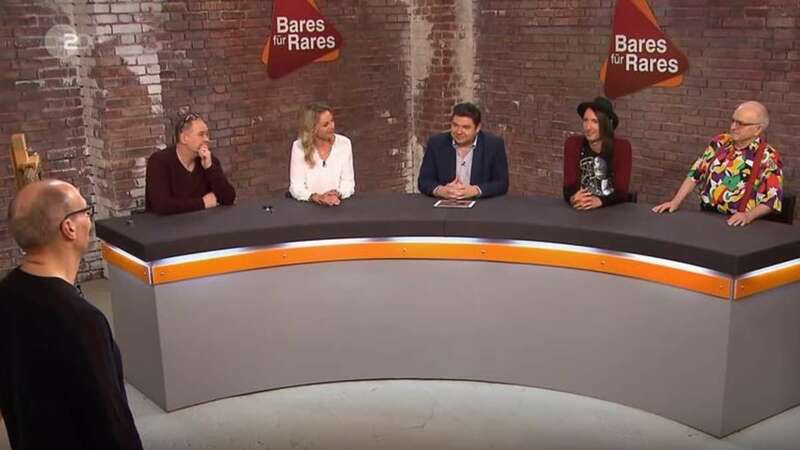 Episodes of the show are done in twos (two evaluations and then two sales) but the network (ZDF) thoughtfully slices them up by seller so that a nine minute video shows a single seller’s approach, evaluation and sale. These are what I prefer to watch (there’s also a description of each item in the video. Not only the host but some of the experts and buyers appear to have also become at least demi-celebrities. I keep wondering about the appeal of this even as I compulsively watch new sellers. Like all reality TV it soon becomes clear that a lot of it is fake, the experts clearly have had a chance to examine and research the items ahead of time and the people waiting in line are also obviously extras. I’m also convinced the buyers have a budget for making bids (and sometimes are clearly overbidding or drive up the bidding so that it won’t look like they’re being mean to a sympathetic seller).
. Is this the culture of an aging planet? Most of the sellers range from 50 to 80 years old which might explain why the rough edges of the original were smoothed away. This is the flip side of German mono-maniacal thinking, by accident or design they’ve created the lowest stakes, most soothing reality TV ever, there’s less tension than an average episode of Mr. Rogers. There is no grand prize, after you pick up your Euros you’re out the door, the closest thing to losers are the occasional delusional sellers who just won’t accpet that their old junk isn’t worth a fortune. The closest thing to villains are the even rarer unpleasant sellers. Rather than a balance between winners and losers it’s just a parade of winners and bigger winners with an occasional ‘did not participate’. The show is the closest thing to an award for participation I’ve ever seen. This entry was posted in Uncategorized and tagged Germany, tv nation. Bookmark the permalink.